Ben Milam Cypress, Texas Historic Tree, San Antonion Texas. 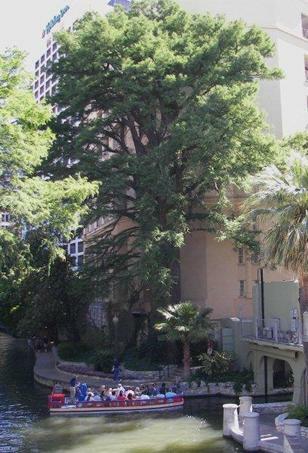 Included in Famous Trees of Texas, published by the Texas Forest Service and Texas A & M University Press, the Ben Milam Cypress can be found between E. Commerce and East Houston Streets on the east bank of the San Antonio River in downtown San Antonio. 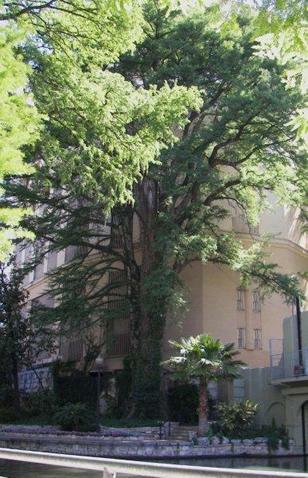 The Milam cypress tree as viewed from the bridge near the intersection of Commerce and Soledad. 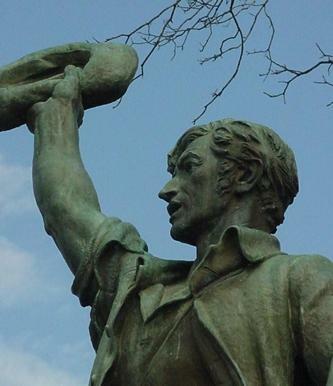 A native of Kentucky and a veteran of the War of 1812, Milam came to Texas via New Orleans and was making a living by trading with Comanche Indians along the Colorado River when he threw in with Revolutionaries seeking independence from Spain. Milam was imprisoned in Mexico City but released through the efforts of the U.S. minister. Returning to Mexico after its Independence from Spain (1824), Milam (technically a Mexican citizen) was made a Colonel in the Mexican Army that year. By 1835 Milam was back in Mexico seeking titles for those who had settled in the dual states of Coahuila y Texas. But the timing couldn’t have been worse. Antonio López de Santa Anna had just overthrown the new government of Mexico, establishing a dictatorship. Milam was captured and imprisoned in Monterrey. He managed to escape and cross the Rio Grande in October of 1835. By chance he encountered troops under the command of George Collinsworth, and only then did he become aware of the Texas Revolution. Milam (now serving as a Private) helped in the capture of Goliad, and then marched with the army against San Antonio (Bexar) which was then held by Gen. Martín Perfecto de Cos and his troops. Milam was dismayed to learn that many members of the Revolutionary Army had decided to abandon the attack on San Antonio until Spring. It was then Milam made his plea to the troops: "Who will go with old Ben Milam into Bexar?" Three hundred men volunteered, and the siege of Bexar began at dawn of December the fifth. General Cos surrendered to the Texian forces on December the ninth, 1835, but Ben Milam had been killed two days previously – shot in the head from a Mexican sniper concealed in the branches of this tall cypress.
. 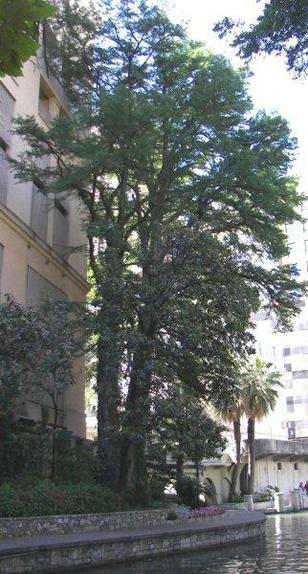 The Milam cypress tree at river level. The other side of the Milam cypress tree. 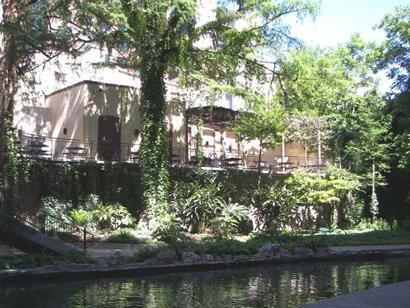 Standing in front of the Milam cypress, looking across the river to the area where the Veramendi Palace once stood.